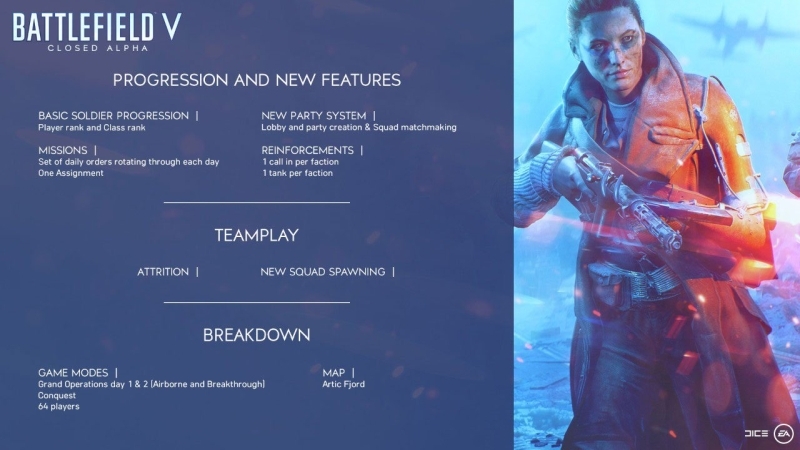 A month ago, Battlefield V held a closed beta for those who pre-ordered the game and entered the program. That beta is now over, but before we’ll move to alpha, there’s gonna be a second closed alpha. The second closed alpha will build directly on what the team has already gathered through the initial alpha. This time they will be focusing on the speed of character progression system. “We have made some changes that we think will better cater to players across all play styles and skill levels based on how fast players scored points, and how quickly they progressed through the ranks in the first Closed Alpha. We’ve also made improvements to matchmaking and fixed issues related to joining squads. Gameplay aspects such as map, weapon, and vehicle balance are still being tested so that we can make sure matches are fun, fair, and reward skilled players”—read’s EA’s blog post on the matter. The alpha works on the basis of invitations—so you have to specifically selected by the team to get in on the action, though people who have entered the original closed alpha will automatically be invited again. The alpha launches August 14th and is going to run “for limited time only”, which is rather unspecific. After that, we’re gonna have the closed beta and finally, full launch on October 19th. Go and create a female character while you’re there and punch some Nazis.